[Wednesday, December 1, 2010] The first SpaceX Falcon 9 demonstration launch for NASA's Commercial Orbital Transportation Services program is targeted for liftoff on Tuesday, Dec. 7. Liftoff will occur from Launch Complex 40 at Cape Canaveral Air Force Station in Florida. [Friday, December 3, 2010] On Friday, December 3rd, SpaceX will webcast its static fire test of the Falcon 9 rocket engines at www.spacex.com. [Friday, December 3, 2010] The X-37B sits on the Vandenberg Air Force base runway during post-landing operations Dec. 3. Personnel in SCAPE (Self-contained atmospheric protective ensemble) suits conduct initial checks on the vehicle and ensuring the area is safe. [Saturday, December 4, 2010] The goal of NASA@Work is to leverage the breadth and depth of NASA technical expertise by offering solutions to challenges that exist in currently funded NASA projects. [Saturday, December 4, 2010] The X-37B, named Orbital Test Vehicle 1 (OTV-1), conducted on-orbit experiments for more than 220 days during its maiden voyage. It fired its orbital maneuver engine in low-earth orbit to perform an autonomous reentry before landing. [Sunday, December 5, 2010] Today SpaceX released the following information on launch day activities for the first SpaceX Falcon 9/Dragon demonstration launch for NASA's Commercial Orbital Transportation Services (COTS) program. [Monday, December 6, 2010] NASA is soliciting proposals for competitive evaluation and award of a Cooperative Agreement to a non-profit entity to develop the capability to implement research and development projects utilizing the International Space Station National Laboratory. [Monday, December 6, 2010] We believe that Internet access is a tool that allows people to help themselves - a tool so vital that it should be considered a universal human right. Imagine your digital life disconnected. [Tuesday, December 7, 2010] The Coalition for Space Exploration today announced veteran aerospace communicators Glenn Mahone of Aerojet and Lon Rains of Northrop Grumman will lead the Coalition's Public Affairs Team in 2011. [Tuesday, December 7, 2010] ESA is looking for new ways to conduct interesting research in space, on Earth - and in between. A number of commercial suborbital vehicles are being considered in Europe, and ESA is looking at the possibilities they might offer for microgravity research. [Tuesday, December 7, 2010] A decision on whether or not to attempt launch on Wednesday will be provided this evening [Tuesday]. [Wednesday, December 8, 2010] Today SpaceX released the following information on today's launch day activities for the first SpaceX Falcon 9/Dragon demonstration launch for NASA's Commercial Orbital Transportation Services (COTS) program. [Wednesday, December 8, 2010] SpaceX made its first SpaceX Falcon 9/Dragon demonstration launch for NASA's Commercial Orbital Transportation Services (COTS) program this morning. Launch occurred at 10:43 am EST. The Dragon spacecraft is in orbit and will return to Earth later today. [Wednesday, December 8, 2010] NASA has entered into a lease with E Green Technologies, Inc. (EGT) Kellyton, Ala., to bring the world's largest airship to NASA Research Park at NASA Ames Research Center, Moffett Field, Calif.
[Wednesday, December 8, 2010] Today, SpaceX became the first commercial company in history to re-enter a spacecraft from low-Earth orbit. [Thursday, December 9, 2010] NASA is negotiating contracts with 350 small businesses that had the best proposals to address critical research and technology needs for agency programs and projects. [Thursday, December 9, 2010] Before the successful launch, voyage, and recovery of SpaceX's Dragon Spacecraft, the first time in history a commercial company has recovered a spacecraft from orbit, reporters were buzzing with news of a "secret" payload, stowed on board. [Friday, December 10, 2010] The National Aeronautics and Space Administration (NASA) Space Operations Mission Directorate is releasing a draft version of the future Cooperative Agreement Notice for the ISS National Laboratory Management Entity. »» Summary of the ISS National Laboratory CAN (not so) "Public Day"
[Friday, December 10, 2010] NASA held a "public day" for the recently-released (CAN) for the ISS National Lab Management Entity at NASA Headquarters today. Didn't now about it? You're not alone. [Saturday, December 11, 2010] Clearly NASA is nowhere near being able to carry out the provisions stated in Public Law 111-26 in terms of the required date - nor does it intend to, if Mark Uhran's statements are to be accepted as being indicative of NASA's intent. [Saturday, December 11, 2010] NASA has awarded a contract with a potential value of $171 million to Lockheed Martin Corp. of Gaithersburg, Md., for support of International Space Station cargo mission services. [Sunday, December 12, 2010] Railguns have also been proposed as a means whereby small satellites could be launched into Earth orbit. They have also been suggested as a means whereby fuel and resources could be launched off of the lunar surface. [Monday, December 13, 2010] NASA Deputy Administrator Lori Garver and Colorado Governor Bill Ritter Jr., participated Monday in a Space Act Agreement signing ceremony in Denver to promote the commercialization of technology developed for the space program. [Tuesday, December 14, 2010] Every year, the President submits his budget request for the federal government to Congress. This year, along with the President's budget request for NASA, we will be submitting our new NASA Strategic Plan, which guides the work we will perform. [Tuesday, December 14, 2010] The NASA Office of Education invites proposals for the NASA Ralph Steckler/Space Grant Space Colonization Research and Technology Development Opportunity. [Tuesday, December 14, 2010] The size, background ecology, and development patterns of major northeastern cities combine to make them unusually warm, according to NASA scientists. [Tuesday, December 14, 2010] Boeing today submitted its proposal for the second round of NASA's Commercial Crew Development (CCDev) program. [Tuesday, December 14, 2010] Orbital Sciences Corporation today announced that it has submitted a proposal to the National Aeronautics and Space Administration (NASA) in response to the Commercial Crew Development-2 contract solicitation. [Wednesday, December 15, 2010] It is quite clear that while NASA is going through the motions of trying to expand the user base for its portion of the ISS, that it is still falling back on bad habits. [Wednesday, December 15, 2010] The Commercial Spaceflight Federation, representing 37 companies employing thousands of Americans nationwide, has selected its next Chairman of the Board, Eric C. Anderson who holds the position of chairman of Space Adventures, Ltd.
[Wednesday, December 15, 2010] With another solid financial performance in 2010, the aerospace industry has again demonstrated its vital importance to the U.S. economy. [Thursday, December 16, 2010] A Lockheed Martin-built spacecraft, NASA's Mars Odyssey orbiter has worked longer at Mars than any other spacecraft in history. [Thursday, December 16, 2010] The House Science and Technology Committee will be chaired by Ralph Hall (R-TX). Hall has represented a northeast Texas district since 1980. [Thursday, December 16, 2010] Aerojet, a GenCorp company, announced today that over the next few months it will expand its presence in the Huntsville community by hiring 25 local engineers. [Thursday, December 16, 2010] On December 8, SpaceX became the first commercial company in history to re-enter a spacecraft from Earth orbit. »» Why Does NASA Not Provide New Space Station Researchers With The References They Need? [Friday, December 17, 2010] At one point Mark Uhran bragged that he had "written 5 papers" on discoveries that had been made on the ISS, but he said that he was not going to tell anyone where to find them - thus challenging the attendees to go dig these papers up themselves. [Saturday, December 18, 2010] NASA Dryden supported helicopter air-drop flight tests of a 5-foot-long, 15-percent scale model of the Sierra Nevada Corporation's (SNC) Dream Chaser spacecraft design under a Space Act Agreement between the two organizations. [Sunday, December 19, 2010] Passengers can now select between informative and relaxing ESA channels on Lufthansa flights. ESA's new relaxation channel features Our Colourful Planet, a collage of spectacular Earth images set to meditative music. [Monday, December 20, 2010] The six-person ISS crew takes one day off a week. If you assume 6 work days for 6 crew at 8 hours a day you get 288 work hours from the crew every week. 30 hours represents 10.4% of the overall crew work time devoted to "science". [Monday, December 20, 2010] NASA has issued delivery orders to three companies as part of its Innovative Lunar Demonstrations Data project. Each order is worth $500,000 and will help develop vehicle capabilities and demonstrate end-to-end robotic lunar landing missions. [Monday, December 20, 2010] The meeting will be held for the purpose of reviewing the Space Technology Program planning and review innovation activities at NASA's Kennedy Space Center (KSC). [Wednesday, December 22, 2010] NASA is seeking proposals from researchers interested in testing new technologies during suborbital flights. The agency also is requesting information from commercial suborbital reusable launch vehicle providers and commercial payload integrators. [Wednesday, December 22, 2010] Galileo's terrestrial nerve centre formally entered service today. With the first Galileo satellites due to be launched next August, Fucino in central Italy will oversee the running of all navigation services provided by Europe's global satellite system. 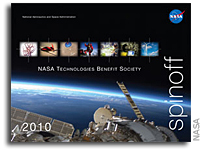 [Wednesday, December 22, 2010] The 2010 edition of NASA's annual Spinoff publication is now available online, highlighting new innovations and notable examples of NASA technology improving everyday life on our home planet. [Thursday, December 23, 2010] Payloads selected under this announcement will fly on aircraft that provide parabolic flight trajectories and on suborbital reusable launch vehicles capable of flying to altitudes above 100 km. [Friday, December 24, 2010] Trinitramid - that's the name of the new molecule that may be a component in future rocket fuel. This fuel could be 20-30 percent more efficient in comparison with the best rocket fuels we have today. [Monday, December 27, 2010] International Launch Services (ILS), a world leader in providing launch services to the commercial space industry, successfully carried the KA-SAT satellite to orbit for Eutelsat Communications of France on an ILS Proton. [Monday, December 27, 2010] The information provided below supplements prior postings at the official procurement web site in specific areas of high interest to potential bidders. [Tuesday, December 28, 2010] We have placed Galaxy 15 in safe mode, and at this time, we are pleased to report it no longer poses any threat of satellite interference to either neighboring satellites or customer services. [Tuesday, December 28, 2010] ESA's GIOVE-A satellite - the first prototype of Europe's Galileo satellite navigation system - is still working well after five years in space. [Thursday, December 30, 2010] On Wednesday, December 29, Arianespace orbited two communications satellites: Hispasat 1E for the Spanish operator Hispasat, and Koreasat 6 for the KT Corporation. [Thursday, December 30, 2010] NASA plans to purchase commercial crew space transportation services to LEO and the International Space Station (ISS) as part of NASA's exploration plans and policies. [Friday, December 31, 2010] The performance of the GSLV-F06 flight of December 25, 2010 (with GSAT-5P Satellite onboard) was normal up to 47.5 seconds from lift-off. The events leading to the failure got initiated at 47.8 seconds after lift-off.